To watch the youtube video where I explain everything, please click here. Ever Heard Of Something Called "The Internet" Before? You've heard of the internet right? Of course you have. But do you actually know how it works? We're going to go over an extremely high-level overview of how the internet works. This one device starts it all. At the most basic level of the internet, there exists a device. This device could be your phone, or maybe your laptop, or even a desktop computer. Honesty, it could even be your washing machine if you had a "Smart" one. ​As long as the device has a networking card that allows it to connect to a router (through wifi or an ethernet cable), then it's internet capable and part of the system. 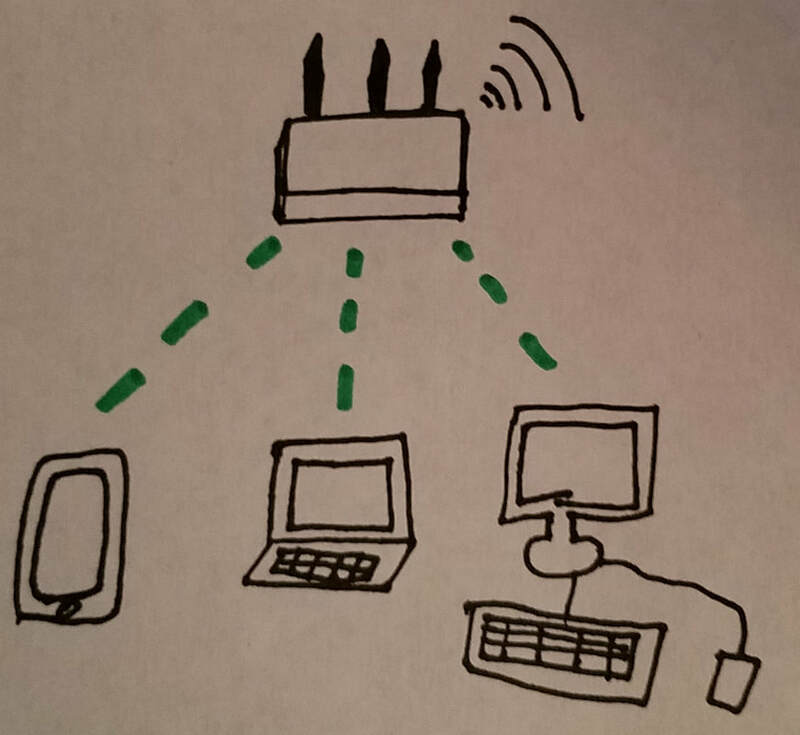 A community of these devices (anywhere from 1 to 255 of them) is formed when they all connect to the same router. Technically, the devices can talk to each other...But mostly they just ignore each other. Suddenly, a community of devices forms when they connect to the same router. ​Routers have the special ability to connect to other routers! (We'll go into the details in a few sections.) That gives communities the ability to talk to each other. It's worth mentioning that there are communities of special devices. These special devices are called "servers". They're just computers that listen for messages from routers, and know how to speak back depending on the situation. For example, at Google's house on the internet, there are a team of special computers that exist only to show the google homepage if someone types www.google.com in their web browser. But how does that process actually work? Okay, so real talk now: you get the overall principle, right? 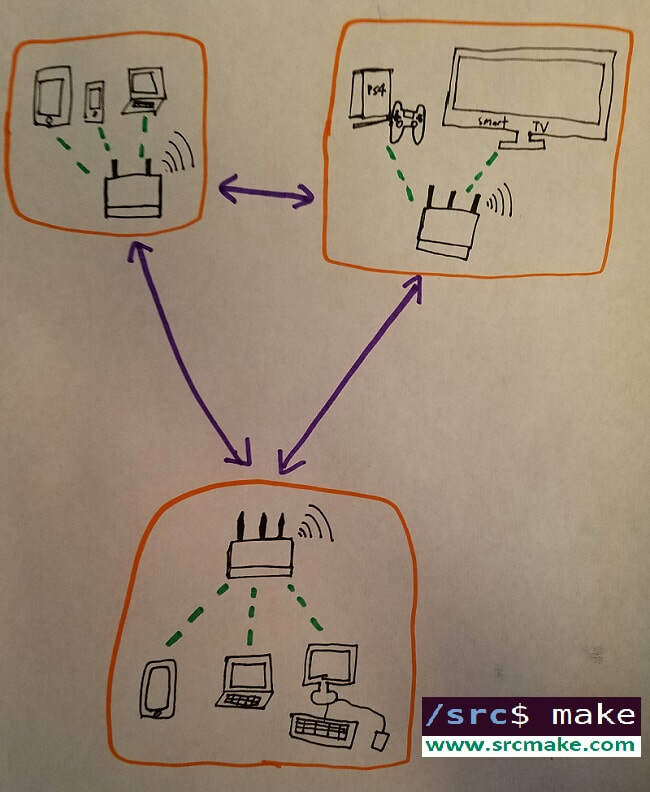 Your device (and others) are connected locally by routers. Then, you pay an ISP (Internet Service Provider) for internet so that the router is actually connected to a working set of cables that they can speak to other routers. But how does the "speaking" actually happen? 1. Your request (from your device) gets sent to the router. 2. 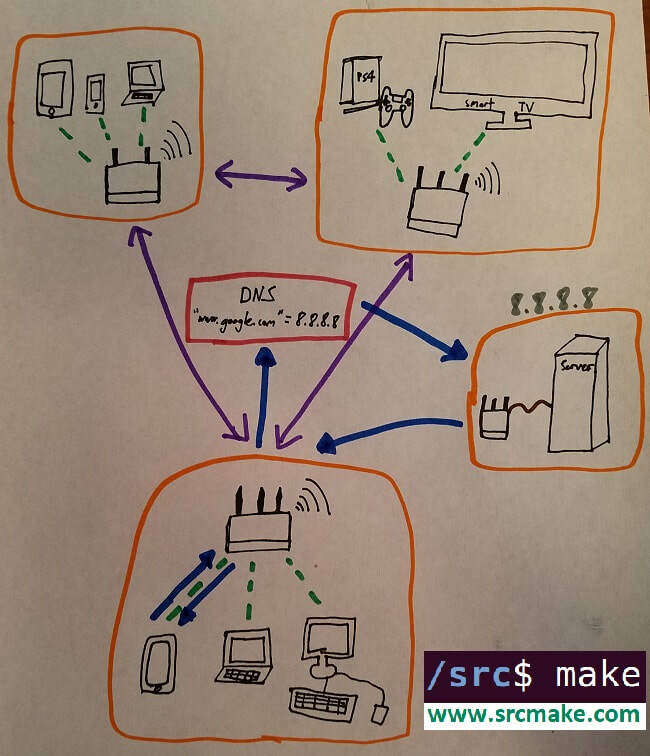 The router sends the request to a Domain Name Server (DNS) by saying "hey some device on my network named "srcmake's phone" is asking me to connect to google.com." 3. The DNS says "google.com? Yeah I know that guy. He lives at 8.8.8.8" (an IP Address). 4. Your request goes to to the IP Address (in this case, 8.8.8.8). 5. The router that lives at 8.8.8.8 sees your message, and delivers it to a special computer that Google set up. 7. The Google computer says "hmmm? Oh, this guy just wants the google homepage. Okay let me put everything they need into a package and send it back to them." 8. That package (which contains HTML, CSS, JS, and media files) is sent back to your router. 9. Your router sends the package to your web browser. 10. Your web browser opens the package and displays the results on your screen. That's it. It's that simple. The internet is just a bunch of connected devices that send data to each other. Of course, I made the situation as simple as possible, but you can now officially say that you know how the internet works!